Do you want a Catholic marriage? The Church wants your wedding to be perfect for both of you and so the Church will encourage you to concentrate on what is at the heart of any successful marriage. True love for one another built in and upon the love of God. Please read about what Catholic Marriage is below and then contact the parish. For the celebration of marriage to take place in a Catholic Church at least one of the partners needs to be a baptised Catholic. If you or your partner have been married before and are now divorced this will need to be explored by the priest to see if freedom to marry still applies. The usual practice is to give at least six months notice of your proposed wedding. 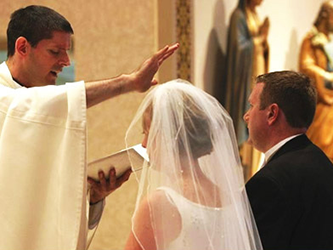 This gives the priest time to arrange the paperwork and the Marriage Preparation Course which you will be expected to attend. Before booking the wedding reception please contact the Parish Priest who will discuss whether a date can be made for your wedding. If this is possible, you will be asked to come to a meeting soon afterwards where the preparation required for your wedding to take place will be explained.